Fujifilm’s new family-friendly rugged compact camera for 2018, the FinePix XP130, has a 16.4 million pixel 1/2.3-inch image sensor along with a 5x optical zoom lens (28-140mm equivalent). New features for this model include Bluetooth connectivity, longer battery life, eye-detect auto-focusing and an electronic level guage. 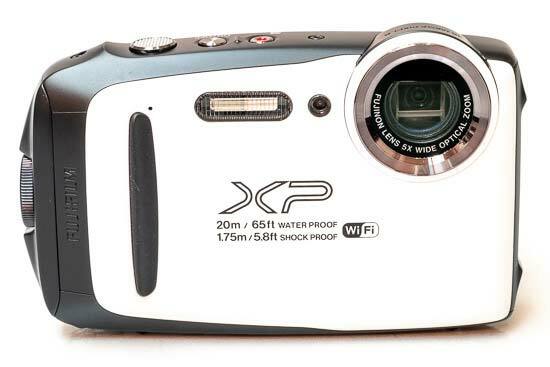 As with the previous XP120 camera, it is waterproof down to 20 metres, shockproof from a height of 1.75 metres, freeze-proof down to minus 10 degrees Celsius and dustproof. Other interesting features include a three-inch 920k-dot LCD screen, in-built WiFi and Full HD video recording. 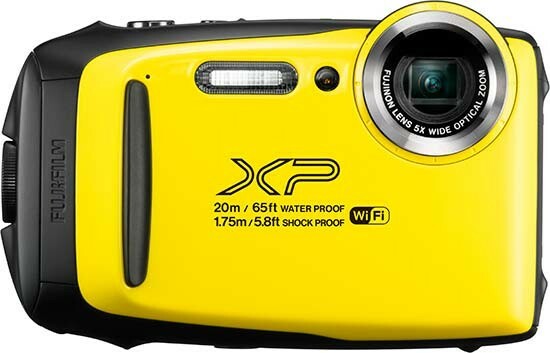 The Fujifilm FinePix XP130 officially retails for £179 / $199. There are only differences between the new XP130 and the it's predecessor, the 1-year-old XP120, namely the addition of Bluetooth connectivity for easier sharing, eye-detect auto-focusing, an electronic level guage to help keep your horizon straight, and slightly longer battery life (240 shots). In all other repects the two cameras are identical, so if you can still find the XP120 at a discounted price, it might be a better fit for you. Subsequently almost everything that we said in our XP120 review applies equally to the new XP130. The first new feature on the XP130 is Bluetooth connectivity. As with Canon's implementation on some of their recent cameras, you can use this feature to connect the XP130 to a smartphone, even when the camera is turned off, and automatically transfer images from it for backup or more probably sharing via your social network of choice. Eye-detect auto-focusing has been added to the Face Detect menu, which now offers 5 different options, 3 of which incorportae eye-detect - they are Face On/Eye Auto, Face On/Right Eye Priority and Face On/Left Eye Priority. In practice we found that the camera reliably detected human eyes in most instances, although as it's part of the face-detect system, the camera also automatically apples red-eye reduction, which can't be over-rided by the user. Thew Electronic Level is turned off by default (we have no idea why), but once you've found and enabled it, it's a fairly useful feature. We say only fairly, though, as it only works for the horizontal axis, not the vertical axis too, and also it's implemented as quite a difficult-to-see, very thin white/green line. The last new "feature" is improved batery life, up from 210 shots on the XP120 to 240 on the XP130, still hardly earth-shattering. One of the best things about the Fujifilm FinePix XP130 is that its small and light, making it easy to slip in a pocket or bag ready for your travels. It’s got a reasonably attractive rounded edge design, and is available in a range of colours. We were supplied with a stylish white option, which is great for spotting the camera if you’re using it in typical tough conditions, such as underwater, but perhaps less so in the snow! 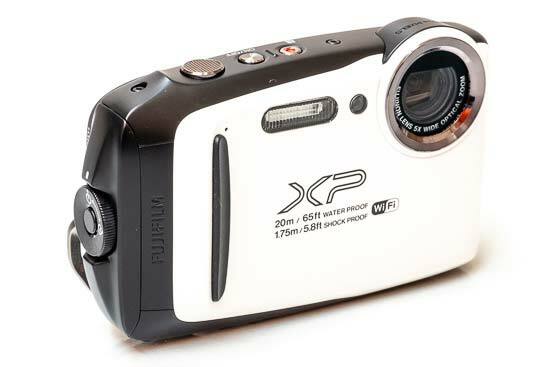 A 5x optical zoom is housed inside the XP130, with no protrusions from the camera even when zooming. This is to make sure that the camera is safe from drops and sealed from water and dust from entering it. 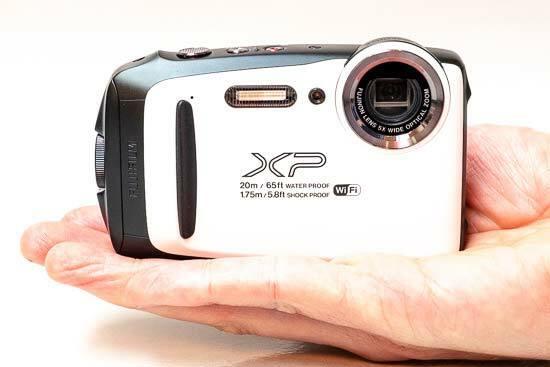 The battery and memory card compartment can be found on the side of the Fujifilm FinePix XP130, and are protected by a locking mechanism which you need to push in and twist to open. This prevents the door from opening when underwater and letting water into the camera. When you switch on the camera, it will prompt you to make sure that the door is fully closed and locked before you use it. Although the buttons are a little on the small side, they are all well pronounced from the body of the XP130, making them easy to find and push when using the camera in difficult conditions, such as when wearing gloves or underwater. Furthermore, all of the buttons are grouped on the right hand side of the camera, so you’ll be able to make any settings changes when shooting one handed. 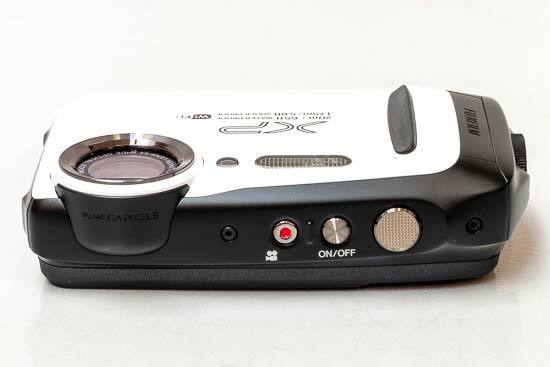 On the top of the Fujifilm XP130 is the on/off button, the video record button and the shutter release. There is a ridge in between the video record and the on/off button so you should hopefully not mistake the two and record accidental videos. The shutter release button is large and textured, again making it easy to find when using the camera underwater or when your visibility is impinged. Flipping to the back of the Fujifilm FinePix XP130, and you’ll find all the buttons you need to make any camera changes. To zoom the lens, you’ll find two buttons marked W (wide) and T (tele). Zooming is reasonably quick and fluid, while the separation of these buttons is useful to keep the buttons distinct when using gloves, or shooting underwater. There’s a small playback button which you’ll use to access your images. From here, you can scroll through your images, and delete anything you don’t need. You can also set up wireless communication to transfer any images you’ve taken across to a smartphone or tablet for quick sharing online. A four way navigational pad is available, with each of the buttons doubling up for a different function. The up button accesses exposure compensation (or delete in playback), the right button accesses flash modes, the left button switches on and off macro focusing, and the down button switches on the self-timer. In the middle of the navipad is a main menu button which gives you access to the main shooting menu where you can make further settings changes. The final two buttons on the back of the Fujifilm XP130 include a direct access to high frame rate button, which doubles up as a wi-fi button. There’s also a display button which you can use to alter how the screen displays information. A range of different shooting modes are available, which you can access through the main menu. Most users will probably want to leave it on Scene Recognition Auto. The camera is good at detecting what kind of image you’re trying to photograph, such as landscape and macro, and change its own settings accordingly. However, there’s also a range of specific scene and auto modes here to choose from. For those who are a little more advanced, shooting in Program mode gives you the option to make changes to certain settings such as white balance and ISO, but you can’t alter shutter speed or aperture. There’s also no raw format shooting available. If you like to experiment with different looks and effects, switching to “Advanced Mode” gives you the option to choose between some different creative filters, as well as using a panoramic mode for ultra wide angle shots. There are also dedicated underwater modes if you find yourself shooting in an underwater situation. A flash is inbuilt for the XP130, which is activated via the navigational pad. It’s worth noting that you can’t use the flash if you’re working in silent mode, but you’ll be prompted to switch that off if you are. 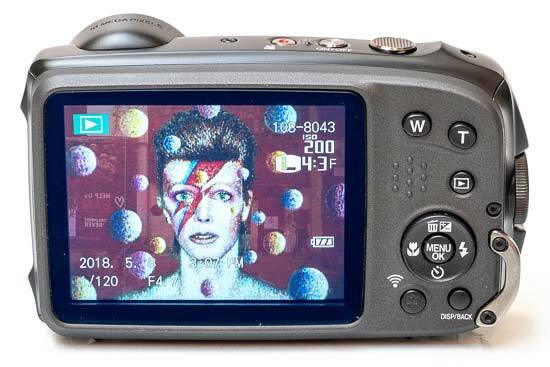 The Fujifilm FinePix XP130’s screen is not touch-sensitive, and it’s fixed. That’s not particularly an issue with a camera like this, because it’s unlikely a touchscreen would work all that well underwater anyway. Generally speaking, the screen is bright enough to be seen from a variety of different angles, but it can be difficult to see what it is displaying if you’re holding the camera underwater, but the rest of you is not - for example, photographing rock pools or near the tide. When shooting in good light, focusing is quick and generally accurate. When activating macro focusing, the XP130 can hunt a little before locking on - it’s unusual for a false confirmation of focus to be displayed, instead, if the camera can’t focus, a red square will be shown. In lower lighting conditions, the camera struggles a little more to gain focus, but a focusing assist lamp helps. Using the Fujifilm FinePix XP130 in general is pretty quick - start up time is just a couple of seconds, while moving through the different settings and viewing your images in playback is generally rapid.